WHO I FISHED WITH: This morning, Saturday, February 2nd, I fished with Austin Fly Fishers member Dave Bush. We welcomed aboard 8-year-old Jarrett Rowell for the first Soldiers’ Kids Involved in Fishing Fun (S.K.I.F.F.) trip of the 2019 season. Jarrett had been patiently waiting for this trip since before Christmas, as foul weather forced two postponements. Jarrett’s mom, Lesa Rowell, initially contacted me after hearing of the S.K.I.F.F. program from another mom at her church. SKIFF serves to put the kids of soldiers on the water at times when duty pulls parents away from their families. Begun in 2009, SKIFF offers trips free of charge to any military family wherein kids are separated from their parent due to that parent’s military obligations from short-term commitments like gunnery or field time at Ft. Hood, to lengthy deployments, and anything in between. Simply call me, Bob Maindelle, at 254.368.7411 to reserve a date. 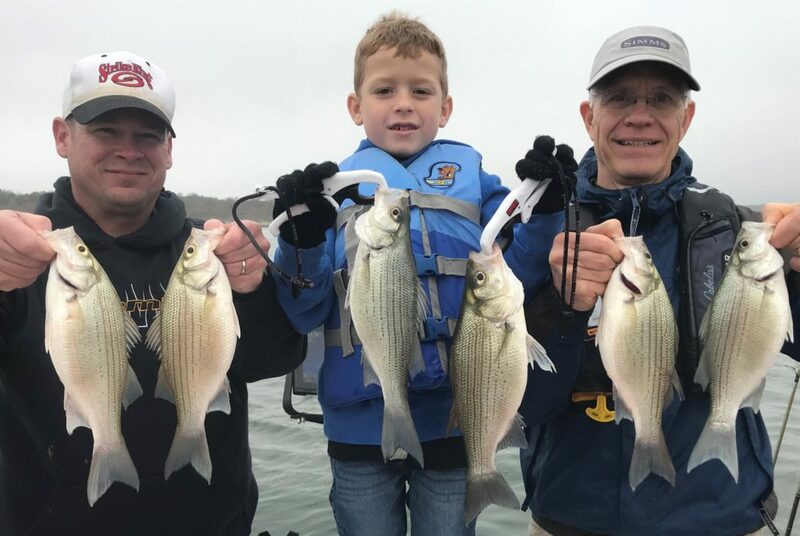 From left: U.S. Army Sergeant First Class Matthew Rowell, his 8-year-old son, Jarrett, and Austin Fly Fishers’ Dave Bush landed 82 fish on the first SKIFF outing of 2019. WHAT WE FISHED FOR: This trip was a multi-species fishing trip focused on white bass. HOW WE FISHED: It just so happened that on Sunday, January 27th, Jarrett’s dad, U.S. Army Sergeant First Class Matthew Rowell, redeployed to the United States from a split tour to Iraq and Kuwait as a field artilleryman. Therefore, he was able to join his son on this SKIFF trip! The ambient temperature was about 55F as father and son stepped aboard my boat at 7:30am on Stillhouse Hollow Reservoir, just west of Salado. The reservoir stood at 4.79 feet above full pool and was dropping fairly quickly, with a 24-hour fall of 0.61 feet as the Corps of Engineers released 3,180 cubic feet per second of water through the dam. After a safety talk, adjusting equipment for my guests, and a word of prayer, we headed to the fishing grounds strictly relying upon GPS to navigate in the thick fog. As we reached a main lake point, we deployed a pair of crankbaits to attempt some flat-line trolling for white bass. In about 30 minutes of effort we got only one strike which resulted in a missed fish. 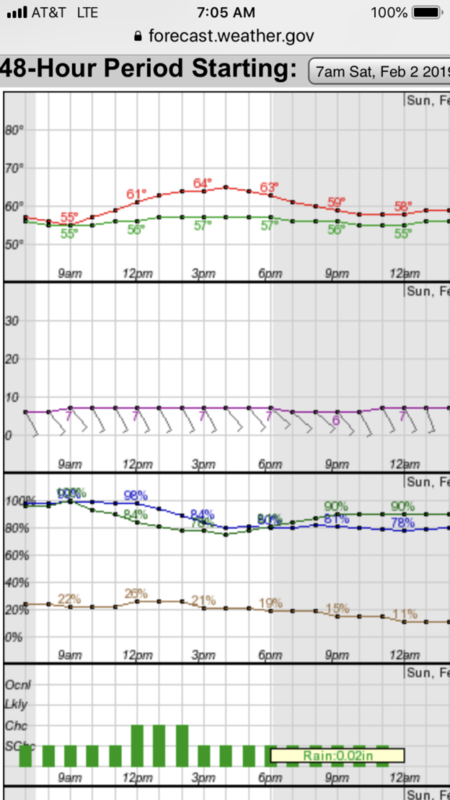 I had warned everyone that our first hour would likely be slow, as it typically is with foggy, calm conditions. Around 8:20 am, our luck changed when the lightest of ESE winds began to ripple the surface. This kicked off the morning white bass feed. As white bass fed on threadfin shad from below, they drove bait toward the surface where ring-billed gulls dipped down to pick up dead and injured forage. The white birds were tough to spot in the fog, but we got to them and confirmed the presence of fish with sonar. The fish were tight to the bottom, but were ready to feed. We all dropped 3/8 oz. slabs of my own design, equipped with a Hazy Eye Stinger Hook, to the bottom and used a “smoking” retrieve to tempt these active fish. Young Jarrett went 5 for 5 on his first several attempts at the technique, each time landing a white bass between 12-13 inches. As we three adults also hooked fish, we passed them off to Jarrett to reel in if he wasn’t already engaged with a fish of his own. We fished three distinct locations over the 4 hour span of the trip, amassing a catch of 82 fish including approximately 4 drum, 1 blue catfish, and the balance consisting of white bass. One of these fish is a pending lake record … but more on that when TPWD certifies the catch!! As the trip concluded, we presented Jarrett with his own red tacklebox with an assortment of gear inside, a closed-faced rod and reel, and a red, logoed S.K.I.F.F. ballcap, all provided by Dave Hill and Manuel Pena. OBSERVATIONS: Calm, foggy conditions (as usual) produced poor results; once the slightest of breezes began and the light level rose a bit, the fish turned on and stayed actively biting from about 8:20 through to around 11:30. Wind Speed & Direction: Winds were calm through 8:20, then began out of the ESE at 3-4, slowly increasing to 7-9 and turning SE. Sky Conditions: Grey, overcast conditions the entire trip. This entry was posted in 2019 Fishing Reports, Uncategorized. Bookmark the permalink.